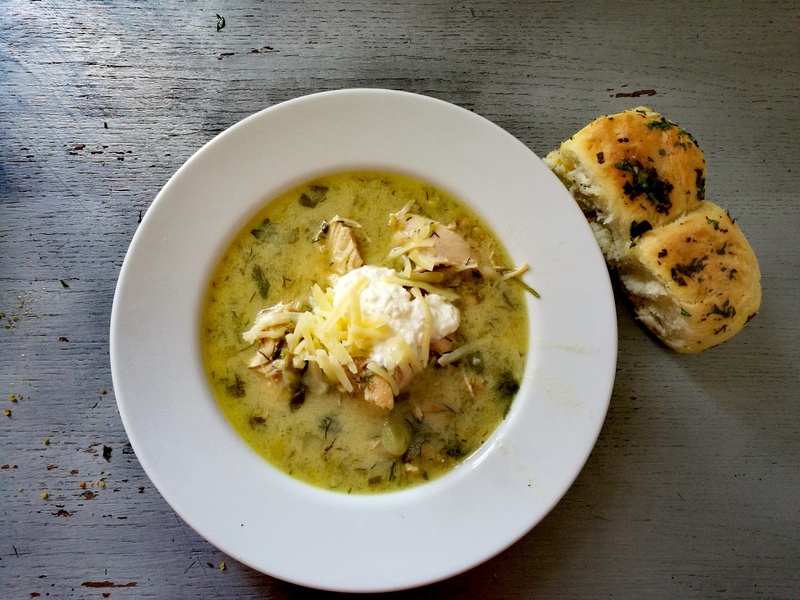 Some of you were interested in this post so today I’m bringing you couple of new recipes: a beautiful lemony chicken stew and tear’n’share garlic bread. The stew is amazing, it invigorates and heals at the same time. Bread is for the extra calorie consumption. In a large pot or casserole dish heat up 3 tbspoons of oil and add seasoned chicken. Fry for 10 minutes, stirring regularly, until it gets golden and remove a side. Meanwhile prep the veg: chop up the onions and garlic, fennel, leek and stalks of the herbs (save the leaves for later). Add the veg to the same oil you fried the chicken on and 0,5 dcl water and cook until it softens. Add the chicken, pour over the stock, season with some pepper, cover with a lid and cook on a medium high heat for 45 minutes, until the meat starts to fall apart. Add the beans, peas and broad beans and bring to boil again. Cook for ten minutes then add the rest of the herbs. Reduce to simmer. Take out the chicken and tear the meat with a fork to smaller pieces. Put back in the stew, season if necessary and remove from heat. Beat up two eggs with a juice of two lemons. Slowly stir in the stew (it MUST NOT coagulate) to get a lovely shine. Serve in bowls with a little more sprinkle of herbs and dollop of yogurt. You need a bit more time for this so I suggest you do this over weekends or on the days you have extra time. In a big bowl mix flour, yeast and q tspoon of salt and make a hole in the middle. Slowly pour in the water all the while mixing until you get a rough dough. 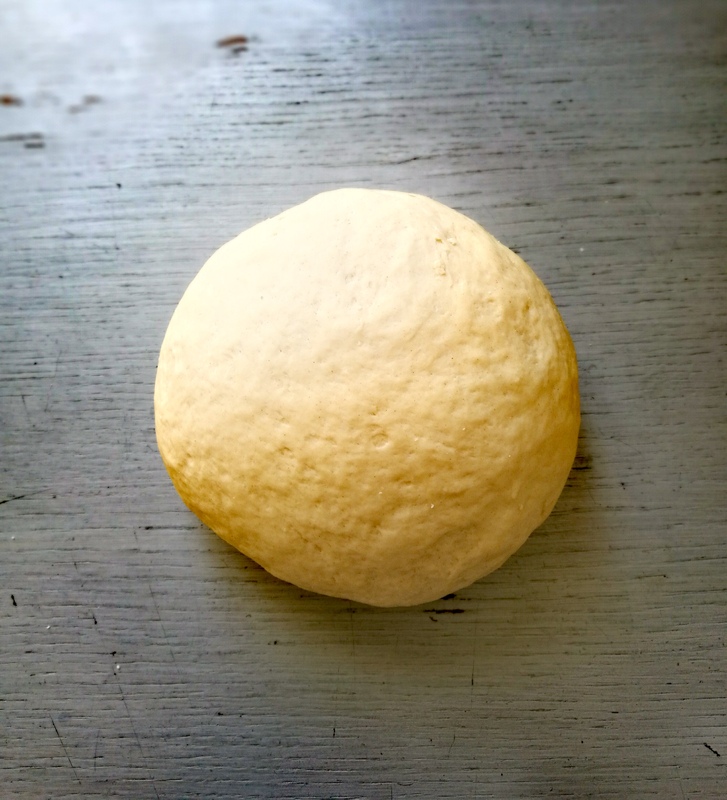 Transfer to a floured surface and knead for 10 minutes until it becomes elastic and smooth and hands are clean. That’s the golden rule of kneading. 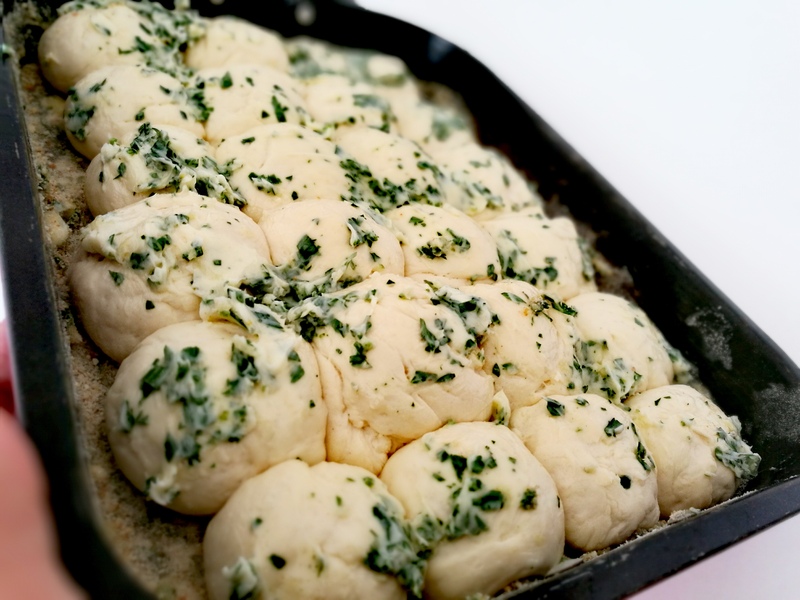 Put the dough in a clean bowl, scar a little X on top, cover with a cloth and leave to rest for an hour. While it’s resting make the butter. 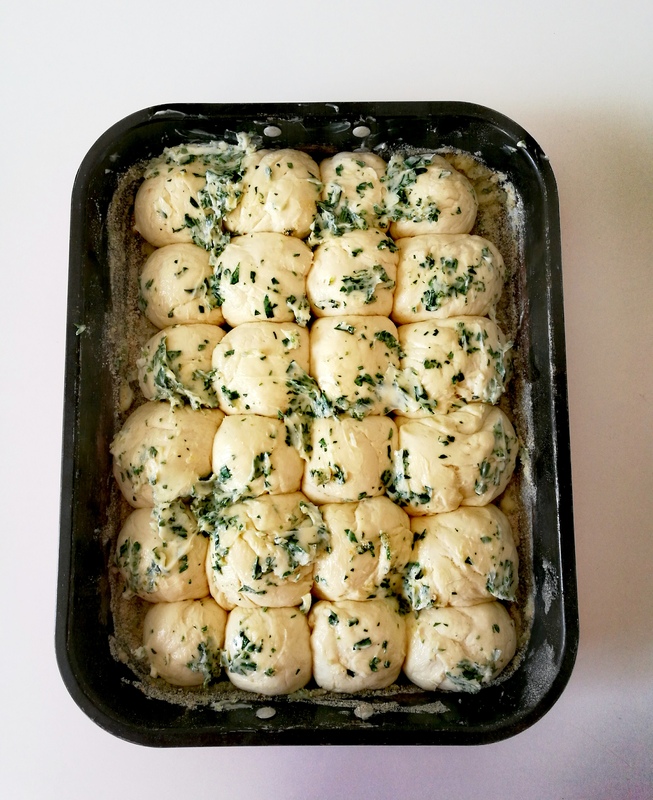 Mix 250 g of butter with half a bunch of chopped parsley and half a bulb of squashed garlic, pinch of salt, tspoon of cayenne pepper and zest of half a lemon. 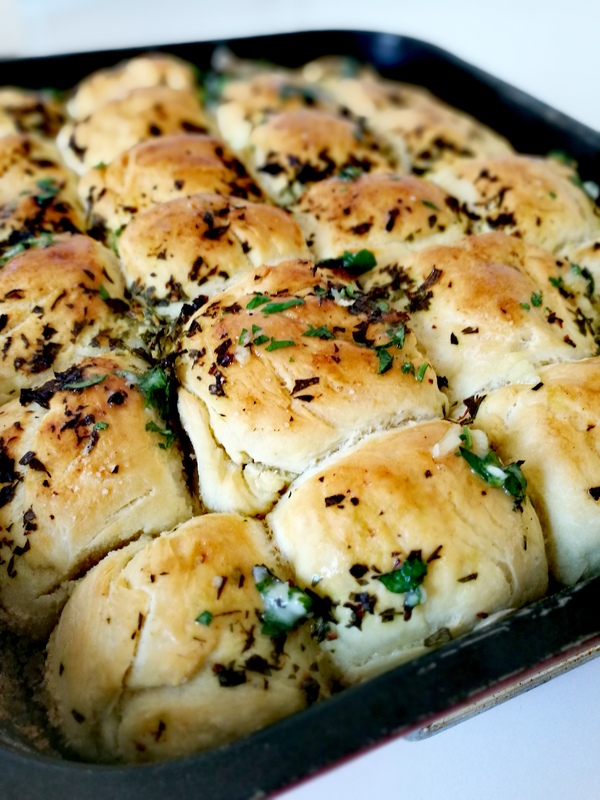 With a third of the butter mixture grease a baking tray (20 x 30 cm) and sprinkle with bread crumbs over the whole of bottom. 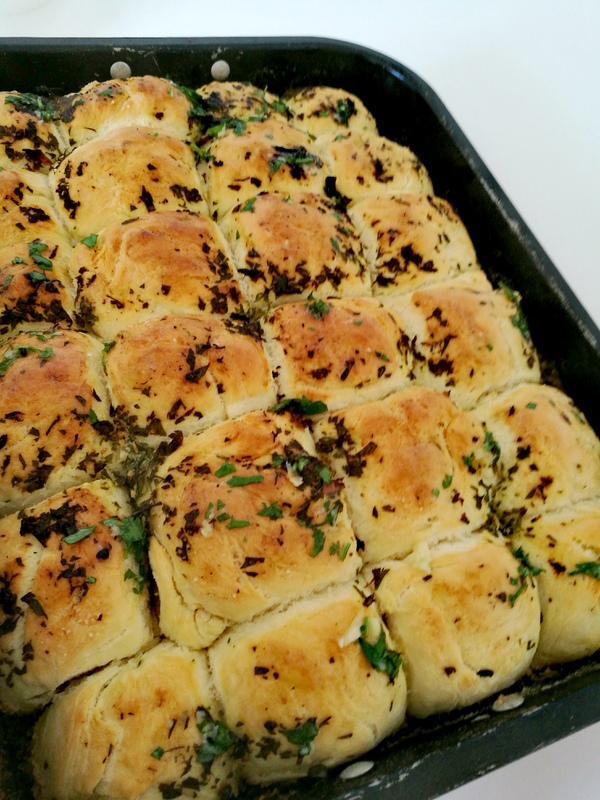 Make 24 little balls of dough and make 6 rows of four balls. Cover with a cloth and leave to rest for min. 30 minutes. Heat up the oven to 190 Celsius degrees. Grease the balls with the second third of the butter mixture and sprinkle with a pinch of salt. Put on the bottom of the oven for 30 minutes until they get yellowish. Then put up direct under the grill until it becomes golden 5 – 10 minutes. Grease with the remains of the butter, put in the middle of the table and let the tearing and sharing begin!